Which means you get your boat rigged the way you want it. Alumacraft offers all major outboard motor lines for your boat. You get the outboard, the features, the options, and the service you want from an industry leading, independently owned boat manufacturer. Choose from 20′ 8″ long, high-performance, deep V-boats to 10′ flat-bottom jon boats. 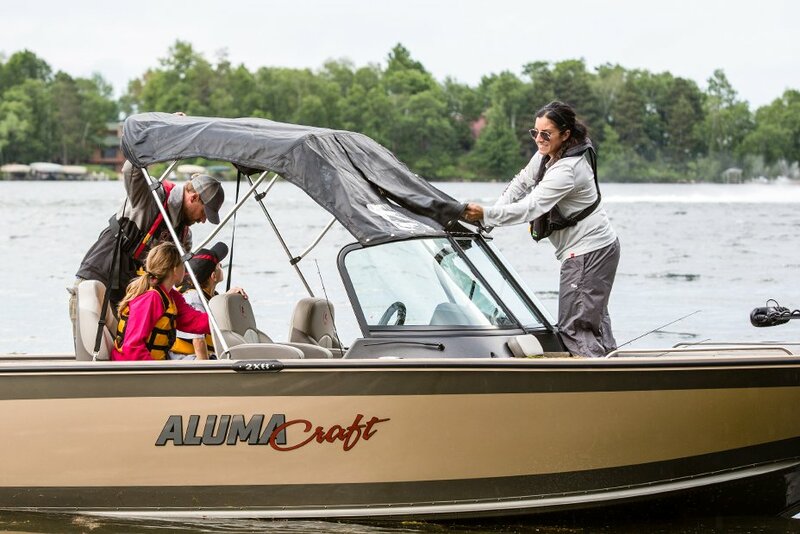 Alumacraft boats come in a huge variety of sizes, shapes and styles for an endless variety of uses and budgets. You name it, we’ve got it. Our pros call it the Alumacraft Ride. These guys have driven virtually every boat on the market. They tell us the Alumacraft Ride is drier, quieter, smoother and more responsive. The exceptional ride of an Alumacraft with the performance of a new Yamaha outboard—it doesn’t get any better. Alumacraft uses the highest quality hardware on the market. Chromed metal hardware is strong, durable and easy to grab and open, even with gloves on. Compare some of the hardware on other boats and you’ll be surprised. All Alumacraft boats, whether it’s our all-welded jons or one of our riveted tournament models, are made with heavy-gauge, top-quality, 5052 marine-grade aluminium. That’s why you see Alumacraft boats that have been on the water for years and years. They last longer. Look real close. You’ll see a tighter fit, smooth, even welds, larger rivets, and precision construction throughout. These are boats you’ll be proud to call your own. Our all-welded ribs can take a pounding. They’re heavier, wider and stronger, making the entire boat tougher and more rigid. Ribs are positioned on narrow 12″ centers. This results in more ribs making the hull stronger the entire length of the boat. Inherent strength is greater with larger rivets. Larger rivets mean stronger rivets. Stronger rivets mean fewer rivets are needed. Fewer rivets mean fewer holes need to be drilled, significantly reducing the chance of ever popping a rivet. Our boats are painted in the same basecoat/clearcoat process and colors used by major auto makers. This process allows the repair of small scratches and areas of dock rash without repainting your entire boat. Matching touch-up paint can be found at more than 4,000 auto repair outlets. We use a single piece of aluminium that is cut and shaped to form the hull. Other manufacturers rivet, or weld, two separate pieces together. Our one-piece design assures there are no seams on the boat’s bottom, providing the greatest possible inherent strength and no heaving.